Google’s Pixel phones have built a decent fan following in the last couple of years, thanks to their pure Android experience, powerful performance, and great camera. Fans were already expecting the upcoming Google Pixel 3 to sport a display notch. 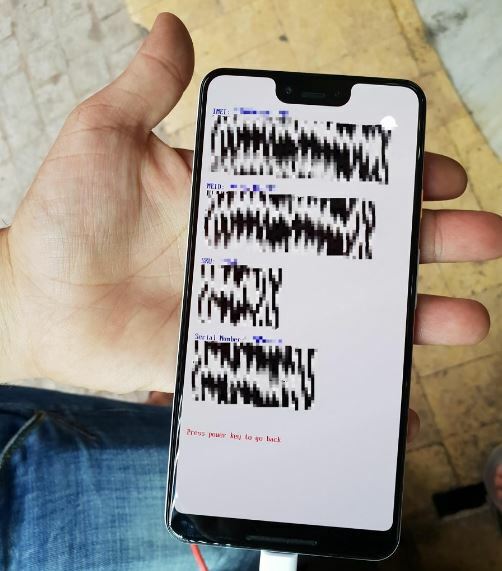 XDA Developers forum member dr.guru has shared leaked pictures of the Google Pixel 3 XL Clearly White color variant. The leak confirms that phone will have a notch, but design is not going to be its biggest selling point. Google’s weird design choices make its phones look like cheap Android handsets from Chinese vendors. The original Pixel and the second-gen Pixel models had a pretty ordinary design. People hoping to see a gorgeous design with the Pixel 3 are going to be disappointed. Leaked images of the Pixel 3 XL Clearly White model reveal that it will have a display notch much taller and narrower than the iPhone X. The phone also has a rather thick chin at the bottom. The presence of a deep notch and thick chin ensures that it will not offer a bezel-less experience like iPhone X. It reminds me of the Huawei P20 Lite that costs less than $300. One reason Google could be reluctant to give up the bottom chin is stereo speakers. The leaked Pixel 3 XL Clearly White model appears to have a bottom-firing speaker for audiophiles. Just like previous leaks, the Pixel 3 XL Clearly White images hint at dual cameras on the front. It is unclear what purpose the secondary front camera will serve. The company could use it to offer portrait selfies with bokeh effects, 3D facial recognition, and/or augmented reality. If Google wanted to offer portrait selfies, it could have easily done so via AI and machine learning without requiring the second camera, just like it does on the Pixel 2’s main camera. The second front snapper on the Pixel 3 XL should serve more than one purpose. On the back panel, it retains the Pixel’s two-tone effect. But there is little difference between the top white shade and the bottom one. As per the XDA Developers forum member, the rear panel will be all glass, likely to facilitate wireless charging which has been missing on the Pixel devices so far. The top part of the rear glass will have a glossy feel while the bottom one is said to have a matte finish. It will have only a single camera and a circular fingerprint reader on the back. According to the leaked handset’s Fastboot screen, it packs 4GB RAM and 64GB of base storage. We also expect Google to launch a 6GB RAM/128GB storage model. 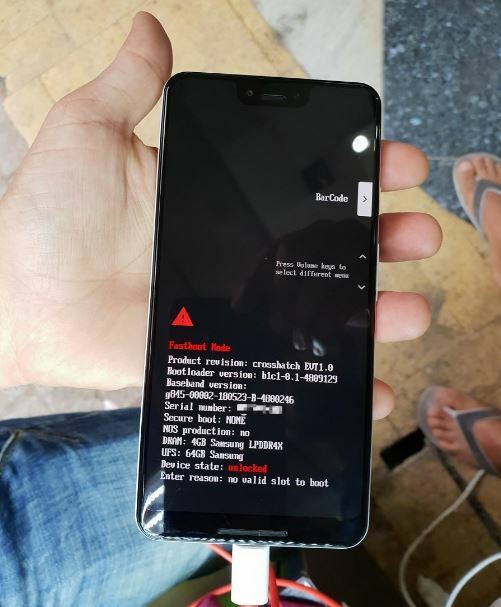 The phone is unable to boot further because it’s been “remotely erased by Google.” This unit is an EVT 1.0 (Engineering Validation Test) model. There is a good chance the device has moved past the EVT 1.0 stage to enter mass production considering its launch is only a couple of months away. 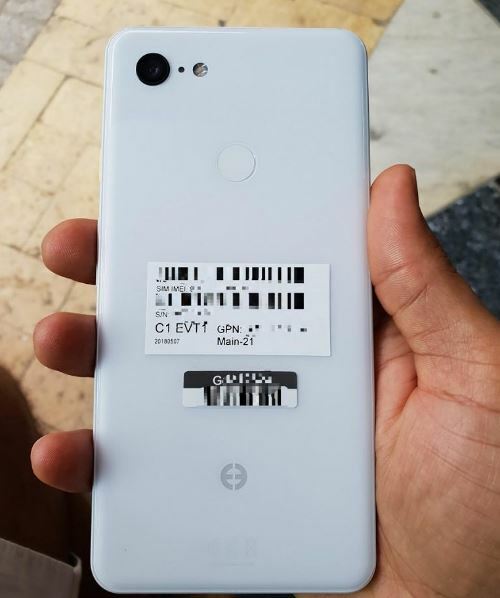 The leaked Pixel 3 XL Clearly White model doesn’t reveal whether the phone will retain the Active Edge squeezable frame or the OLED display. Previous leaks suggest the phone will keep the Active Edge technology that allows users to activate Google Assistant by squeezing the frame. It is expected to use LG Display’s P-OLED screen, which was also found in the previous generation Pixel phones. According to the rumor mill, the Pixel 3 XL will have a 6.2-inch P-OLED display with a 19:9 aspect ratio. The smaller Pixel 3 is said to launch without the notch. It would feature a 5.4-inch P-OLED display with thick bezels at the top and bottom and an 18:9 aspect ratio. Both models should have a USB Type-C port and Android P software out of the box. Just like last year’s models, they will launch without the 3.5mm headphone jack. Both models are expected to run Qualcomm’s flagship Snapdragon 845 chipset that powers devices like OnePlus 6, Galaxy S9, and Galaxy S9 Plus. Since they will run pure version of Android P, they should get all the cool features coming with the new software such as advanced AI and Digital Well Being. Google hasn’t yet revealed when it would announce the new Pixel phones. But the company has traditionally refreshed its Pixel line on October 4th. The original Pixel debuted on October 4, 2016 and the Pixel 2 was unveiled on October 4, 2017. We expect the company to show off the Pixel 3 and Pixel 3 on October 4, 2018. Twitter tipster Evan Blass claims Google will launch the Pixelbook 2, second-gen Pixel Buds, and its own Wear OS smartwatches at the same event.